Part of our commitment to providing the best possible support services through Blackboard was creating a new position dedicated to monitor and shape day-to-day interactions: making sure everyone is dotting their I's and crossing their T's. Chuck Angel joined the team to develop strong communication with Blackboard and to create unity between the two organizations. At Miami, Chuck has various important responsibilities. His title is IT Service Delivery Analyst II, but that's just a fancy way of saying he is in charge of our side of the Blackboard relationship. He spends his days driving overall improvements with the Blackboard Service Desk, ensuring that contractual obligations are met within agreed-upon parameters, and liaising with faculty and staff regarding support experiences. Chuck has an associate's of science degree from Lincoln College of Technology, and he also boasts ITIL (Information Technology Infrastructure Library) v3 Foundations technical certification. "Prior to Miami, I have worked in IT service delivery for two of the largest global IT service providers in the world," he said. "I managed delivery for numerous markets with varying levels of support obligations." It's safe to say: Our faculty, staff, and students are in good hands with Chuck on board the Blackboard transition. 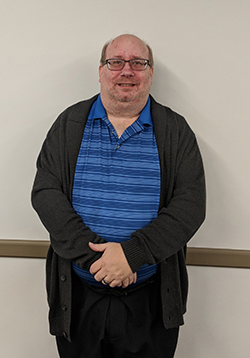 When Chuck isn't traveling to Blackboard's facility in Somerset, Kentucky, or working on support process improvement, he's an avid gamer and reader and enjoys experimenting with the culinary arts. He also loves to go bowling. In fact, he used to bowl competitively and served as the director for the Miami Valley United States Bowling Congress. "I used to bowl in a holiday tournament that had obstacles out on the lanes to either bowl around (chair) or cover the lane so you couldn't see the pins," he said. "We even had to use a stick to push the ball down the lane." We're still waiting for Chuck to show us all up at the winter break IT Services bowling league - he would probably have a professional advantage over the rest of us! We're happy to have him on board here in IT Services. Welcome to Miami, Chuck! In addition to bringing Chuck on as our Blackboard liaison, Angela Robbins is another key member of the team as we transition to managed support. A short-timer only slated to be with us for another ten months, Angie is an employee of Blackboard, but we still consider her an important part of the team. Her duties can be boiled down to figuring out how to marry Blackboard services with Miami University's needs. This means collecting data on faculty, staff, and student needs and determining process improvements with the end goal that everyone in the relationship is satisfied with the level of service being provided. 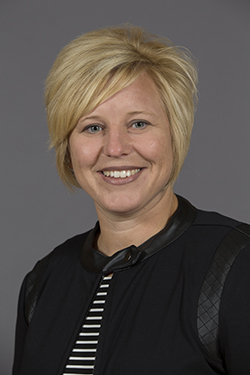 Angie has a stellar background in educational fields and is expected to graduate this May from Capella University with a doctorate in instructional design for online learning.